Produced by GLOBE VIDEO FILMS "Echoes of the Class 37s" is the second in the popular series of videos marking a tribute to this famous class of diesel locomotive. Nationwide views along with the unmistakable sight and sound of more than 80 members of the class are seen both on freight and passenger workings throughout the 1990s. Almost all livery variations are included. 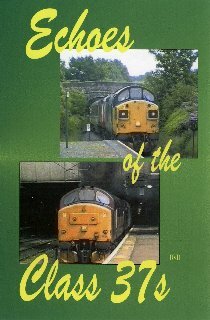 DVD has been produced in full colour to add to your enjoyment including locos/location/train details. Narrative has been deliberately omitted so as not to compromise the distinctive sound of the Class 37s at work.